Pictured below is a device we recently made to turn any typical 24 hour 7 day timer into a 24 Hour 28 Day Timer. This particular unit was designed to run a pump for 20 minutes once every 28 days to supply an unattended irrigation system header tank with water. The user simply has to programme their existing programmable 7 day timer to turn on for the desired duration once per week. Our add-on board detects when that timer’s internal relay closes, and every fourth time (i.e. fourth week), it closes its own relay which turns on the pump. 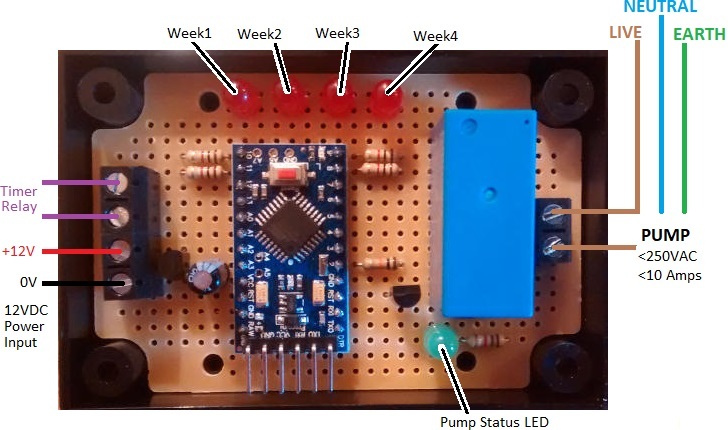 Red LEDs on the board are used to show which week it currently is out of the four weeks that make up 28 days, and those LEDs also flash whenever the timer is on to give visual confirmation of the status of the system. Programmable digital timers have a back up battery which ensures that time is kept accurately during a power cut. Our board stores the current week in memory, so that in the event of a power cut, it will remember which week it was in when power is restored. If you need any kind of special timer, please email neil@reuk.co.uk with details of your requirements.